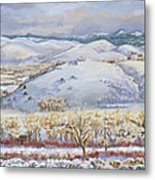 Winter Panorama From The River Mural is a painting by Dawn Senior-Trask which was uploaded on July 16th, 2010. 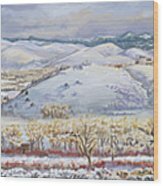 This Winter Panorama from the River Mural shows the Encampment River flowing past the small Wyoming town of Encampment. I hiked through the snow to get to this view from the back country hills. Delightful and beautiful winter scene, and so talented captured! 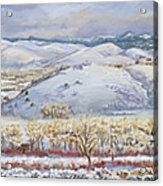 wow Dawn this has me speechless this landscape is so beautiful incredible detailing and technique love the rolling hills so unique to you!! !The area you live in is stunning!! ...thank you for showing us the beauty of Wyoming this would look wonderful framed!! wow never saw a more rich and delightful wintry landscape so much detail and so moving you are very talented Dawn in many mediums and this is a favourite!! Thank you, John, for the feature! Thank you, Bob and Nadine, for the feature! Magic Is Believing in Yourself. If you can do that, You can make anything happen.... Congratulations Your work was chosen from Hundreds of images. 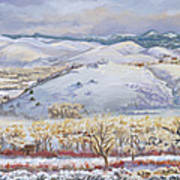 . . .. to be FEATURED in the Group Gallery - ART Impressionism to Realism . . . . ..
Beautiful panarama! Very well done!